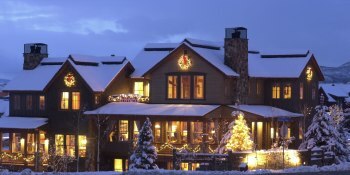 Proving that luxury home buyers are still active, The Porches of Steamboat Springs, Colorado, has made six sales; three fractional interests in the Private Residence Club and three whole ownership units, over the last six months. The Porches accounted for nearly half of whole and fractional sales of residences in Steamboat with square footages over 4,000 square feet. It attracted interest from a multitude of second home buyers across the country. "Our sales success this year is somewhat surprising given the tough economic climate," said Bruce Shugart, developer of The Porches. "But we have remained true to our vision, emphasizing three core tenants: quality craftsmanship, exceptional service and attention to detail. Delivering on this promise has enabled us to remain viable during the downturn." The Porches is Steamboat's premier community for families looking to create lifelong memories. Located at the base of the ski resort and two minutes from the Gondola, The Porches redefines the term "luxury" in the area, offering whole and fractional ownership as well as nightly rentals in one of the country's hottest mountain destinations. Residences offer four to five bedrooms and bathrooms, large gourmet kitchens, personal game room, cozy fireplaces, flat screen TVs and a bunkroom for the kids. As demand persists into 2010, The Porches plans to continue the construction of additional residences and is in the process of building additional units. Currently, there are two whole ownership opportunities available as well as fractional units in three floor plans: Cottonwood, Blue Spruce and Ponderosa. Fractional buyers in Steamboat Springs have several choices. In addition to The Porches, there is the new One Steamboat Place, which just opened this month and is covered in our other article today. The destination clubs Ultimate Escapes and Quintess have homes in Steamboat, and Exclusive Resorts has plans to open some homes there.